An Employee Stock Ownership Plan (ESOP) refers to an employee benefit plan that gives the employees an ownership stakeStockholders EquityStockholders Equity (also known as Shareholders Equity) is an account on a company's balance sheet that consists of share capital plus retained earnings. It also represents the residual value of assets minus liabilities. By rearranging the original accounting equation, we get Stockholders Equity = Assets – Liabilities in the company. The employer allocates a certain percentage of the company’s stock sharesStockWhat is a stock? An individual who owns stock in a company is called a shareholder and is eligible to claim part of the company’s residual assets and earnings (should the company ever be dissolved). The terms "stock", "shares", and "equity" are used interchangeably. to each eligible employee at no upfront cost. The distribution of shares may be based on the employee’s pay scale, terms of service, or some other basis of allocation. The shares for an employee stock ownership plan are held in a trust unit for safety and growth until the employee exits the company or retires. After their exit, the shares are bought back by, and thus returned to, the company for further distribution to other employees. An Employee Stock Ownership Plan invests in the employer’s company. The goal of the plan is to align the interests of the employees with the interests of the company’s shareholders. By giving the employees a stake in the company, the employees move from being only workers to being owners of the company. The plans motivate employees to do what is best for the shareholders, since they are shareholders as well. Companies with a majority employee-ownership are referred to as employee-owned corporationsCorporationWhat is a corporation? A corporation is a legal entity created by individuals, stockholders, or shareholders, with the purpose of operating for profit. The creation involves a legal process called incorporation where legal documents containing the primary purpose of the business, name, and location and are similar to worker cooperatives. The difference with an employee stock ownership plan, as compared to a worker corporative, is that with an ESOP the company’s capital is not evenly distributed. Senior employees are allocated more shares than newly hired employees, and therefore, the latter exercise less voting power during shareholder meetings. When a company wants to create an Employee Stock Ownership Plan, it must create a trust in which to contribute either new shares of the company’s stock or cash to buy existing stock. These contributions to the trust are tax-deductible up to certain limits. The shares are then allocated to all individual employee accounts. The most common allocation formula is in proportion to compensation, years of service, or both. New employees usually join the plan and start receiving allocations after they’ve completed at least one year of service. The shares in an ESOP allocated to employees must vest before employees are entitled to receive them. Vesting, in this case, refers to the increasing rights that employees receive on their shares as they accumulate seniority in the organization. 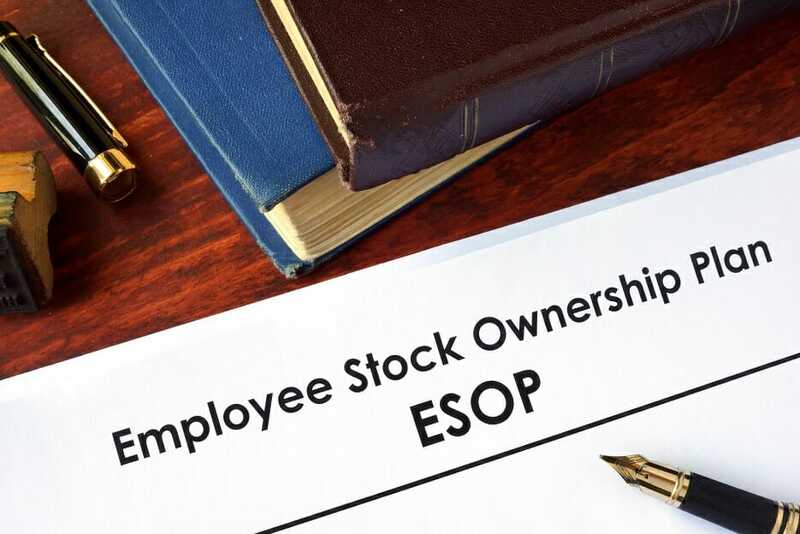 When employees who are members of the ESOP leave the company, they ought to receive their stock. Private companies are required to buy back the departing employee’s shares at fair market value within 60 days of the employee’s departure. Private companies must have an annual stock valuation to determine the price of the shares. Where some longstanding employees are exiting the company, and the share price has accumulated substantially, the company needs to make certain that is has enough money to pay for all the share repurchases. One of the benefits of Employee Stock Ownership Plans is the tax benefit that employees enjoy. The employees do not pay tax on the contributions to an ESOP. Employees are only taxed when they receive a distribution from the ESOP after retirement or when they otherwise exit the company. Any gains accumulated over time are taxed as capital gains. If they elect to receive cash distributions before the normal retirement age, the distributions are subject to a 10% penalty. Companies with an ESOP in place tend to see higher employee engagement and involvement. It improves awareness among employees since they are given the opportunity to influence decisions about products and services. Employees can see the big picture of the company’s plansCorporate StrategyCorporate Strategy focuses on how to manage resources, risk and return across a firm, as opposed to looking at competitive advantages in business strategy in the future and make recommendations on the kind of direction the company wants to take. An ESOP also increases employee trust in the company. Employee stock ownership plans not only benefit the employees but also result in positive outcomes for the company. According to the National ESOP Comparison Study conducted by Rutgers University, the adoption of ESOPs resulted in a 2.4% increase in the annual sales growth, annual employment growth 2.3%, and increased the likelihood of company survival. An improved organizational performance increases the share price of the company and ultimately, the balance in each employee’s ESOP account. Employees who are members of ESOP concentrate their retirement savings in a single company. This lack of diversification is against the principle of investment theory that advises investors to invest in different companies, industries, and locations. Worse still, the employees lock their savings into the same company that they depend on for salaries, wages, insurance, and other benefits. If the company collapses, then the employee faces the risk of losing both their income and their savings. Examples include the Enron and WorldCom company collapses where employees lost most of their retirement savings. An Employee Stock Ownership Plan is designed in a way that limits benefits to newer employees. Employees who enrolled in the plan earlier benefit from the continuous contribution to the plan, giving them a higher voting power. This is, however, different for newer employees who, even in stable companies, may not accumulate as much in savings as the longstanding employees. Therefore, newer employees are given limited opportunity to participate in crucial decisions during annual general meetings and other forums. Share ownership in an Employee Stock Ownership Plan is dilutive, meaning it reduces the percentage of ownership that each share holds. As more employees join the company, they are allocated shares to their accounts in the plan. This reduces the overall percentages of the shares held by older members in the plan. The dilution also affects voting power, since employees who hold high voting power, owing to their higher number of shares, end up with reduced voting powers after new members are admitted. Equity Carve-outEquity Carve OutThe process of partial divesting of a business unit and wherein a minority share is sold to outside investors is known as Equity Carve Out or ECO.